Those of you from Massachusetts will know that it shouldn’t take four hours to get from Boston to the Cape. But, because it was a Saturday afternoon, Cape traffic was in full swing when I left for vacation last week. We pulled up to our rental house tired, sore, and – above all else – hungry. One of my favorite parts of vacationing with my family is that they surrender to my cooking experiments. I take over the kitchen for the week and keep everyone well fed and happy, with the help of my sister’s boyfriend, Matt – a grill master and breakfast champion. After unexpectedly spending two extra hours in the car, we were all beyond hungry when we arrived. We didn’t have much to hold us over: just peanut butter, jelly, and some condiments. So a few of us hopped back in the car – hard to do after sitting in one for so long – to grocery shop. Almost immediately we decided on hamburgers, hot dogs, corn on the cob, and this recipe for grilled romaine lettuce. The first time I was encouraged to try grilled romaine (by my friend Emily’s mom, at her home in New Hampshire – they serve it with freshly grated parmesan cheese), I was skeptical but intrigued. Warm lettuce seems odd, but try it once and you will never want romaine lettuce any other way. The lettuce begins to caramelize and wilt, much like sautéed spinach or kale, bringing out the earthy and buttery romaine flavor. The core of the romaine remains crunchy and the tips of the leaves crisp up from the heat. If you don’t own a grill (like me) you can achieve the same effect by broiling romaine in your oven. Just keep a close eye on what’s going on so the lettuce doesn’t get too crispy (i.e., burned). Fire up the grill (or broiler) to a medium flame. Slice 3 large heads of romaine lettuce in half the long way. Drizzle the cut sides with 1.5 tablespoons olive oil and sprinkle with ½ teaspoon salt and ½ teaspoon black pepper. 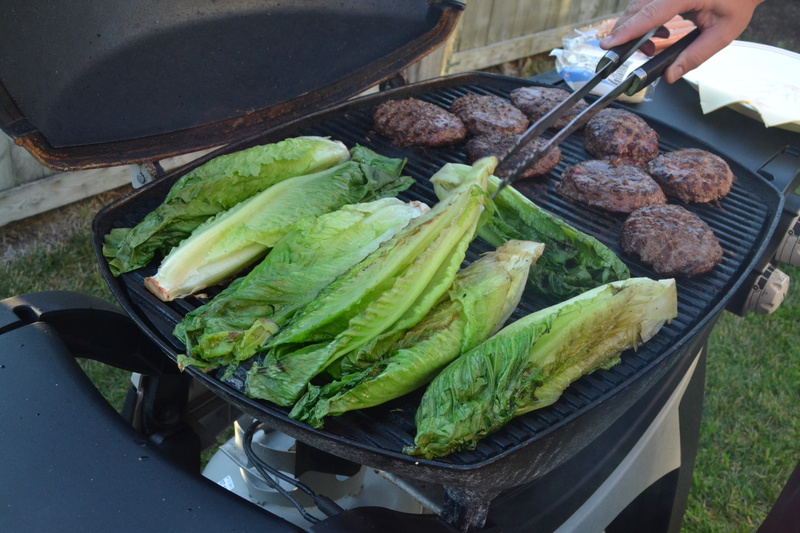 Place the romaine cut side down on the grill. Put down the cover and grill for about 4 minutes. When the leaves have started to caramelize and grill marks have formed, flip it over and grill for 3 more minutes. Squeeze the juice of 1 lemon over the lettuce. You can serve it whole, which makes for a stunning presentation, or chop it up and serve in a salad bowl. Did I also mention this is extremely inexpensive? Enjoy! Yield: 3 servings. Per Serving: $1.93, 80 calories, 7g fat, 3.5g carbs, 2g protein. This entry was posted in Salad, Vegetarian and tagged broil, grill, lettuce, romaine by cooklikekayla. Bookmark the permalink.